Spray broiler pan with olive oil spray. Pour in vegetables and coat with olive oil. Frozen vegetables bake at 400 degrees for 30 minutes – longer for fresh. 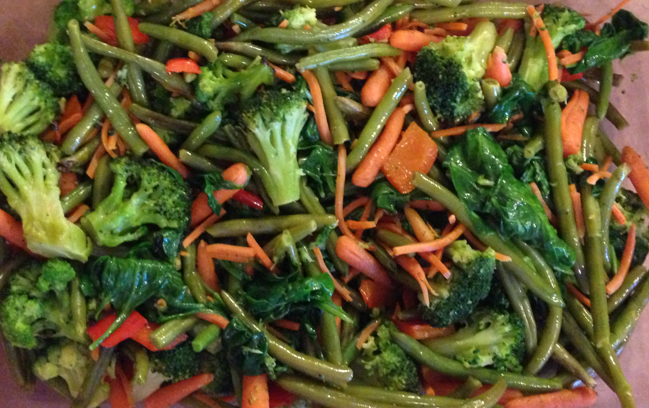 After vegetables cooked – top pan with fresh baby organic spinach and bake for 5 minutes. The spinach will be steamed on top. When cooked – pour 2-3 tbsp. olive oil on top of veggies and mix well. Add seasoning to taste. Note – cooked olive oil loses most of it’s heart healthy benefits so be sure to add more once vegetables are cooked. To take to an event, pour in crock pot with cup of water at bottom and keep on warm. **If you have other favorite veggies such as cauliflower or zucchini, add those as well.